Have you ever seen those notifications on websites that appear at the bottom of the page when you start scrolling down, and disappear when you scroll up? In this article, let’s build one for ourselves. We will also see how to give an option to our visitors to permanently close the notification, in case they find it annoying. This Div needs to be positioned in the bottom corner of the page to achieve the effect we’re aiming for. We also need the close button at the top-right corner of the Div. We start by setting position:fixed to keep our div at the bottom of the page. We have also set visibility of the div to none, as our requirement says that the div should be visible only when the user scrolls down the page. In order to render the close button, we have explicitly set a width and height for it and have set display:block. To show and hide the notification message when the user scrolls, we will make use of the jQuery .scroll() event which fires whenever the element's scroll position changes, regardless of the cause. In our case, we will apply it to the browser window. scrollTop() gets the current vertical position of the scroll bar and we compare it with the height of the scroll to see if we are halfway there. If yes, we show the notification using fadeIn(). When the user scrolls up, the same logic is used to determine if we are about halfway up, and hide the notification using fadeOut(). On the click event of the span, we use fadeOut() to hide the notification panel and remove the scroll event listener from the window object using off(). View the page in the browser and you will be able to show and hide the notification as you scroll. Some of you by now might have noticed that this solution is not complete. When you hit that close button, the notification is hidden only until the user decides to reload the page again. Create a new file called ‘NotificationsUsingCookies.html’. Use the same markup as we used earlier. The code more or less is the same, except that we are setting a cookie to save the user’s preference and reading it while displaying the notification. For demo purposes, the cookie is set for 10 seconds. However you can always increase the duration to an hour, a day or even a year. This was a very basic example of using cookies. If you are looking for a complete example of reading/writing cookies with full unicode support, check the Mozilla documentation. Also note that this example will not work if the user decides to delete the cookie or if the browser does not support cookies. Ever since the pre HTML5 era, I have always found the behaviour of document.cookie to be strange. For eg: when you assign to it, it adds/updates a cookie instead of replacing it. Overall I feel it could have been designed better, than what we have now. I kind of tend to rely on a nice cookie plugin, rather than using cookies directly in my code. The jquery-cookie plugin by Klaus Hartl (https://github.com/carhartl/jquery-cookie/tree/v1.4.1) is a nice lightweight jQuery plugin for reading, writing and deleting cookies. It’s maintained regularly, contains a hosts of features, handles browser quirks and is easy to use. Create a new file called ‘NotificationsUsingCookiesPlugin.html’. We will use the same markup as we used earlier. To make it a session cookie, omit the expires option. This way the cookie gets deleted when the browser exits. If your browser supports HTML5, you can avoid cookies and instead use HTML5 local storage to save user preferences. Unfortunately covering an HTML5 specific example is beyond the scope of this articles but you can always read https://www.dotnetcurry.com/showarticle.aspx?ID=1001 to learn more about how to use HTML5 storage. For demo purposes, the cookie is set for 30 seconds. However you can increase the duration to an hour, a day or even a year. 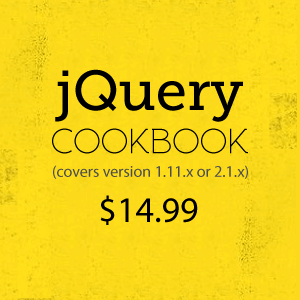 If you liked this article, take a look at my new book The Absolutely Awesome jQuery Cookbook which contains scores of practical jQuery/jQueryUI recipes you can use in your projects right away.